Moderate. In mild winter areas or sheltered sites, seedlings that sprout in fall may survive to spring. Seedlings that sprout in early spring easily survive light frosts. Strawberry. You can use the light texture and soft colors of nigella to break up clashes between cornflowers and calendula, which can be grown on a similar schedule. Sow seeds in prepared beds and gently press them into the surface. Keep moist until the seeds germinate. 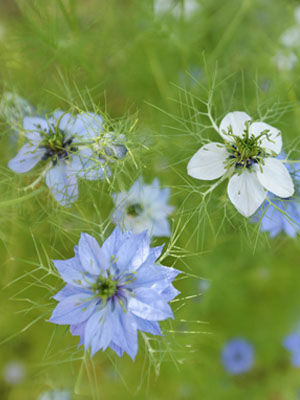 Because of their lacy foliage, nigella seedlings are easy to recognize among weeds. Nigella usually grows better from direct-sown seeds than from transplanted seedlings. Because nigella blooms for only a few weeks, it is best to sow seeds two or three times from late spring to early summer. Flower colors include white, blue, pink and purple. Many gardeners like to gather the decorative dried seed pots for use in dry arrangements. When the pods begin to brown, clip them off and hang them in small bunches to dry. Nigella plants may decline rapidly in very hot weather. This flower self-sows in most gardens.